What is important in a hotel? Okay, I feel the need to wax philosophic about what is really important in a hotel. Why? Because I think I might be a little weird in my priorities, and I wonder if there are folks out there who might be stranger than me. I doubt it. Here's my priority list. First, clean. Okay, obvious. Everyone probably agrees. Second, bed. Hampton Inn wins on this one for "normal" hotels. Most probably agree on this one, too. Next comes the shower head. I hate a low one. Too many hotels, especially the really old ones, no matter how nice, have shower heads about five feet high. Drives me insane. I really wish travel places would list shower head heights for hotels. Next we have the space in the bathroom. Again, old hotels can be insanely posh, but most have tiny bathrooms. It was a different era, but I hate it when there's hardly any counter space (especially when you're not the only one in the room). I really hate it when you can't get dressed without bumping into the toilet. 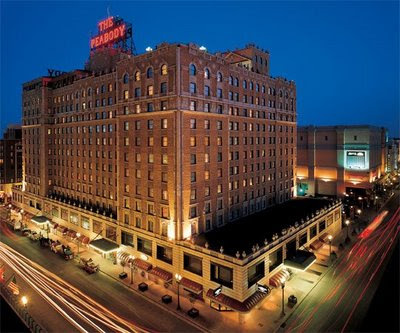 Those of you who haven't traveled much to big old cities might not believe me, but trust me when I say there are a lot of hotels out there that are very nice, very expensive, and have a bathroom the size of a postage stamp. Having no exhaust fan in the bathroom is a big let-down, too. Nothing is more annoying than starting to sweat when you get dressed in the bathroom thanks to a lack of ventilation. It's only a minor annoyance that the mirror fogs up, but the sweating thing? I hate it. Good air conditioning is important. Most have this, though I occasionally get a room where it won't quite get cold enough. I'm really picky in this regard, though, and probably unfairly so. But what really bugs me is when the AC controls won't let me turn the fan to "on" instead of "auto." I like the air noise. A lot. So much so that when I road trip I take a "white noise" machine with me just in case. But it's a little cumbersome on airplane trips, so I make do with my laptop as a white noise generator, but it's just not the same. That's pretty much all I want a hotel to definitely have. Internet? Nope, don't care. TV? Don't care much about that, either. I do appreciate other amenities when they exist, but I'm talking about bare essentials here. Some hotels have things I don't want, too. Like when they only have valet parking. It can be extremely inconvenient, not to mention expensive. Or when they pretty much won't let you handle your own luggage. Sometimes that's nice (like when you're on a long trip with kids), but most of the time I'd just assume carry my own luggage. It's not that I'm cheap, it's just that it's not worth it to me to have to tip some dude to do something that I could have just as easily done myself. I also don't like it when the maids go out of their way to bug me that my Do Not Disturb sign was out all day. I know! It's one thing to annoy you the first time you do it. But every day? That's right, I typically don't need my hotel room cleaned, oh, ever. I'm a fairly neat person, I recycle towels well, and I'm not afraid to ask for a couple more towels when I need them. It sort of amazes me when "resorts" charge for every last little thing. Isn't the catch with a resort supposed to be that you have everything you need in one place? And they're already expensive because of that. Why do most of them feel the need to rip you off even further? I guess it's because there are enough morons out there who will pay it, but it seems crazy. I've stayed at "resorts" where the Internet was $15 per day. The fitness room? $15 per VISIT. A couple eggs, bacon, hashbrowns, and toast? $25. Valet parking? $25 per day. A pack of M&M's from your mini-bar? $5. Unbelievable. Maybe I'm just simple. I prefer a nice clean room, comfortable bed, good shower with some floor and counter space and a fan in it, and nobody bugging me to help me with stuff I don't need. Good Internet, TV, and fitness room is a very nice bonus. Why is that so hard? Product Description of the day! Routine and responsibility are for schmucksunless the routine involves surfing. 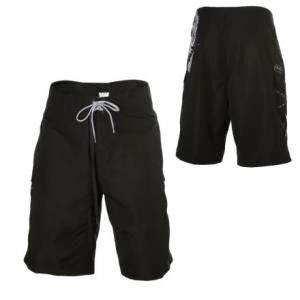 The Reef Drifter Board Shorts are totally down with your wandering ways. Their flying skull and Reef screen prints keep your beach-bummin' style up to par, and the Lycra fly won't harsh your junk's mellow. Are you a single chick flying on Southwest? If so, prepare yourself properly for what might lie ahead. Know the signs! Yes, I'm stuck in the car randomly surfing stuff. This was found because I now "follow" Southwest Airlines on Twitter. They post random funny stuff like this, along with important stuff like travel weather advisories. I'm not cool enough to be a Mac person? Huh? Oh, no, I'm not talking about me. I'm definitely cool enough to be a Mac person. Especially since I don't think you have to be cool to be a Mac person. But apparently Microsoft is now targeting customers who "don't think [they're] cool enough to be a Mac person." That's the line in their latest advertisement, anyway. To me that says "if you are insecure, we want YOU as our customer!" Doesn't it? Most of the commercial is really about how much more Mac laptops cost than PC laptops, I know. But that part just struck me as really odd. As for the cost thing, well, all I'm going to say about that is you get what you pay for. UPDATE: I hate doing updates to existing blog posts, but it hasn't been long since I posted this and then I ran across this article about this same ad spot. Sheds a little more light, but doesn't change my initial point about Microsoft leaving that bit in the ad about her not being "cool enough." Why does every strip mall, no matter how small, have a Chinese buffet restaurant in it? Well, I succumbed to the twitter thing. Again. I'm not really sure why because I don't really need yet another social network, but we'll see. My big problem is that right now there aren't a ton of people I know on twitter. So if any of you are considering dabbling in social networking, give twitter a try. It's not terribly intense like Facebook or MySpace, but it's still sort of cool. Plus you can be among the group of people that knew within SECONDS of Lance Armstrong's latest crash that he had a broken collar bone but otherwise was fine. Which is kind of cool. So if you try twitter and want to "follow" me, I'm "djb_rh". Look me up. I'm in the book. I can't help it, but more politics. No, I wasn't going to "pile on" with the rest of the Republicans with the news that Obama's current budget proposal would send the deficit spiraling toward four times what the GW Bush administration sent it to, but then I read another article on the same news page. It made me cringe. Do these people even know what they're really going out canvassing for??? I think I just threw up a little bit in my mouth. Now, the problem here is the question. "What's on your mind?" Well, one could be confused into thinking that you should now just type what's on your mind. Like "I'm craving pancakes." But if you do that, what everyone sees becomes "Donnie Barnes I'm craving pancakes." That's right, the action is the same as before, but the labeling has changed. So now people think the action may have changed to, so until people get the hang of it, you see a lot of status updates that aren't grammatically correct nor even close. What I don't get is how someone running a site with 100 million users couldn't see this coming as a bad thing? Go to jail part two! So Bernie Madoff hosed investors out of as much as $65B. That's sixty-five billion dollars. He did it over more than twenty years, and his marriage pre-dates that time. In fact, he and Ruth have been married over fifty years now, which means everything he's done successfully in life is half hers. What I want to know is why her liability, at least financially, is any different? But let's revisit that. First is the question of jail time. I honestly have no idea if she should be in jail, too. We may never know, because one thing you can respect Madoff for is that he's trying to take the entire fall for this thing himself. That's where the respect ends, obviously, but hey, it's something. But we don't know if she knew anything. If not, fine. It's definitely possible that she didn't. People in her world can make that kind of money legitimately over that kind of time. I get that. But here's my rub. She and him built a life together. It sounds like she wasn't a "working" wife, but who cares? If they were to divorce (before all this happened), she'd have gotten a big old settlement that kept her insanely wealthy forever. Why? Because they built it together. In many states, it's half. And with good reason. I'm not going to question that. But now that we know he robbed all those people of more money than he (and her) are currently worth, why is she entitled to anything? To me, if your joint fortune is built together illegally, even if one party has no idea, well, that party with no idea is just another victim. Want part of the pie? Get in line with everyone else who got robbed and take your fair share just like they will. I'm pretty sure that fair share isn't $69M. Unless, of course, it's proven that you DID know what was going on. Then go directly to jail, do not collect $200. So this woman embezzled $10M over six years. She was the bookkeeper for a large cabinet making company, and her husband was a cabinet installer. What did she spend the money on? Shoes, clothes, purses, and remodeling a bathroom into a walk-in closet to hold all her loot that was complete with a big TV, among other things. She did it simply by paying her personal bills with company funds! So she obviously wasn't the sharpest knife in the drawer. And now that it's been uncovered and she's busted, supposedly her husband is "not suspected in any crime." Say what? A bookkeeper and cabinet installer are living large on ten million spare dollars over six years and he had no idea something might be fishy? He can't be considered, oh, an accomplice? Or at least an accessory? No, not a purse, a criminal accessory. Seriously? Sounds like a district attorney needs a spine here. Or some education. Or something. But this guy should go to jail and should most definitely NOT collect $200. Okay, I got this via email and it started out "you know I NEVER forward stuff, but..." and so what the heck, I checked it out. Glad I did. It's a good "perspective changer" that I think a lot of us need, myself included. Check it out (and thanks, Michelle!). Don't you blow in that dog's face! 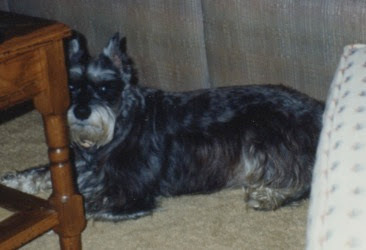 A good many years ago now, my Dad bought my Stepmom a miniature schnauzer named Truman. He's pictured here. He was one of the coolest dogs ever, but died a few years ago. He lived a full and happy life. We all miss that one. He was a puppy was when I was still in high school. I used to do crazy and annoying things when playing with him, like putting one end of one of his toys in my mouth and letting him get ahold of it. We'd then play tug of war. Yeah, gross. Anyway, another thing I would do was to blow in his face. Just a quick puff. He's snap at you. I was pretty quick, though, and he never got me. But for some reason, Dad hated me doing that. Any time I did it with him around he'd yell at me..."stop that, don't blow in that dog's face, he's gonna bite you!" And if I didn't listen I'd get in trouble. But I'd do it occasionally anyway and he'd admonish me. Our living room couch was very long. It was the couch that got me addicted to long couches, in fact. I could lay down on it in between the armrests fully stretched out comfortably. And so could Dad. That particular couch was also somewhat low. One day my Stepmom and I were both in the living room and Dad was laying on the couch. On his stomach. With his head turned out to the room. Truman came into the room and around the corner of the couch. For reasons we've never quite determined, a very odd thing happened. As Truman went by Dad's face, Dad blew. A nice little puff. Problem is, when you're laying like this, well, you have no real recourse to move quickly. And Truman snapped. And Dad couldn't move. So Truman bit him with those tiny sharp puppy teeth...RIGHT ON THE NOSE. Dad let out a pretty good yelp, Truman bounded backwards, and Cathie and I absolutely lost it. Yes, my Dad can have a bit of a temper, but this was too much. We were both in tears laughing. Dad was in tears of both pain and embarrassment. I think we must have laughed for a full minute. As we got our breath, Cathie couldn't help it...she just said "Ronnie, you shouldn't blow in that dog's face." And we lost it again, though this time I could swear Dad smiled. Just a little.